So has anyone played with changing the ride height by extending or shortening the linkage? the linkage has two positions in which I can be set properly so the locking bolt can locate, the change would be to great to extend the linkage and leave it in the F position, in saying that there is about a two turn margin in the correct location. I had mine in P for a few months and for me with the standard spring and our roads seemed better. I'm back to F now but I've put in a 8.5 spring in and had the shim stack changed. You do not need to go through all that. All you need is a cheapy automotive jack. Simply remove the rear hugger, pre loosen the F/P bolt and nut, and then remove the load off the spring by increasing jack height until you can spin the loosened bolt by hand. See my picture below. As for the torque values, I measured and used 5 ft lbs on the pinch bolt screw and 24 ft lbs on two bolts depicted below. You do not need to loosen the torx bolt as it pivots anyway. 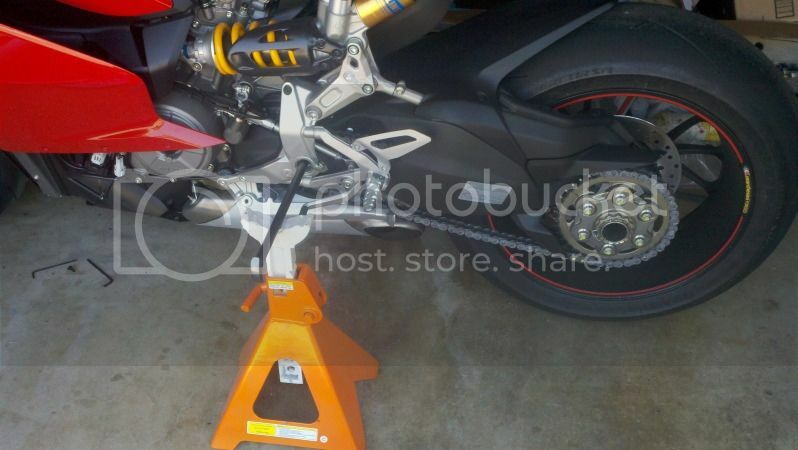 This method can be done with the bike sitting on the ground on the side stand. I only had my pitbull stand in place because I was doing several jobs at once. You also do not need a long wrench to remove the buried bolt for the other end of the linkage. This job can be done in 15 minutes. Have done the same as above but there is "load" on the p/f bolt,cant get it to spin free by hand. I have the bike on rear stand. Can i loosen it with a ratchet anyway? Last edited by Zelnik; Mar 13th 2016 at 11:13 AM. Not much help here.. 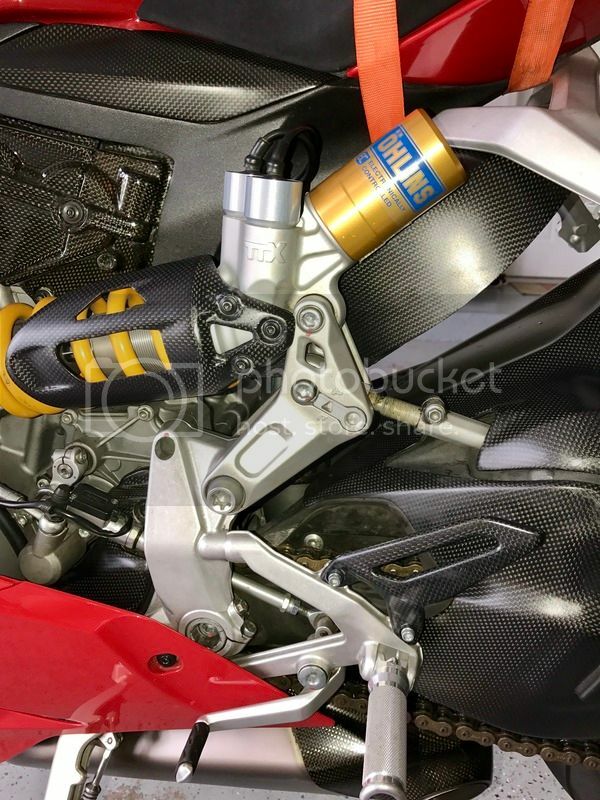 I borrowed the abba stand from a friend and bought inserts for Panigale 1199. Problem solved! I dont recomend this method above. 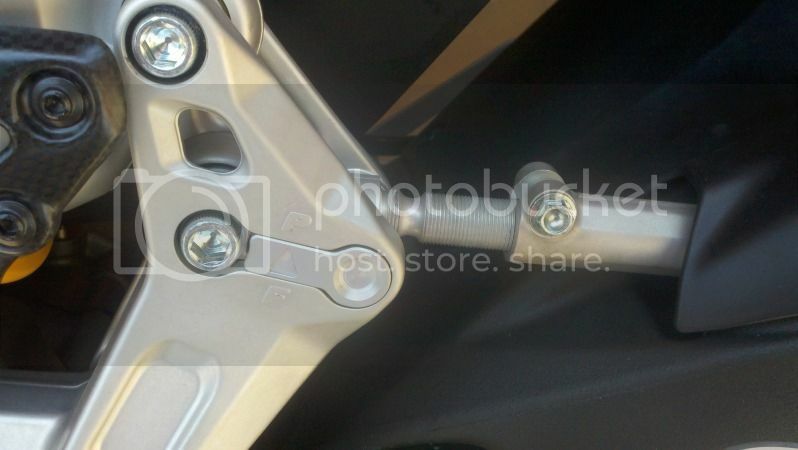 Ok so I switched my rear shock linkage from "F"(flat) to "P"(progressive) today and shot a few photo's. The rear suspension is still stiff but way better. I can actually feel the rear suspension moving now. My afternoon ride was much more enjoyable and the rear doesn't bounce sideways in bumpy turns. 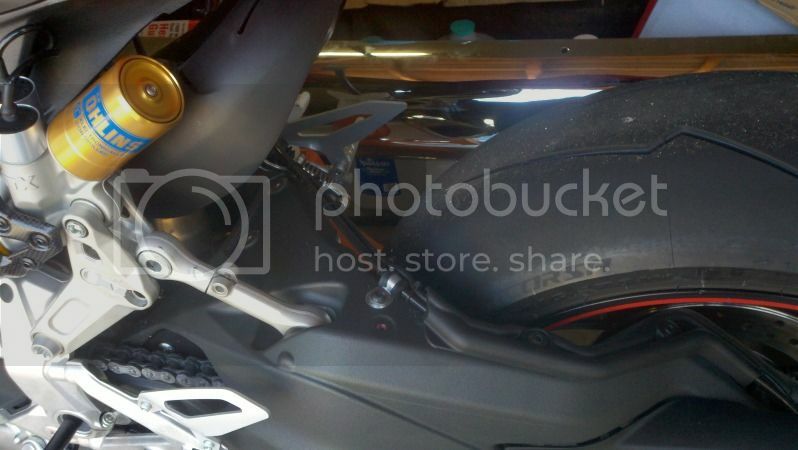 OK first thing I did was remove the lower fairings on both side's. Its not really necessary but I did it anyways just because they get really really close to the lifting points where your inserting the pry-bars/rods to lift the bike. Refer to manual to remove lower fairings. Next I placed one pry-bar inside the large hole right in front of the rearset(right side) and placed a jack-stand under it. The bike was not lifted at all at this point. I then straitened the bike, made it level and placed the other pry-bar on the other side of the bike(left) with a jack stand under it. This holds the bike level and upright. I then moved from side to side lifting the pry-bar while raising the jack-stand and letting it lock into position. This slowly lifted the tire in the rear off of the floor. 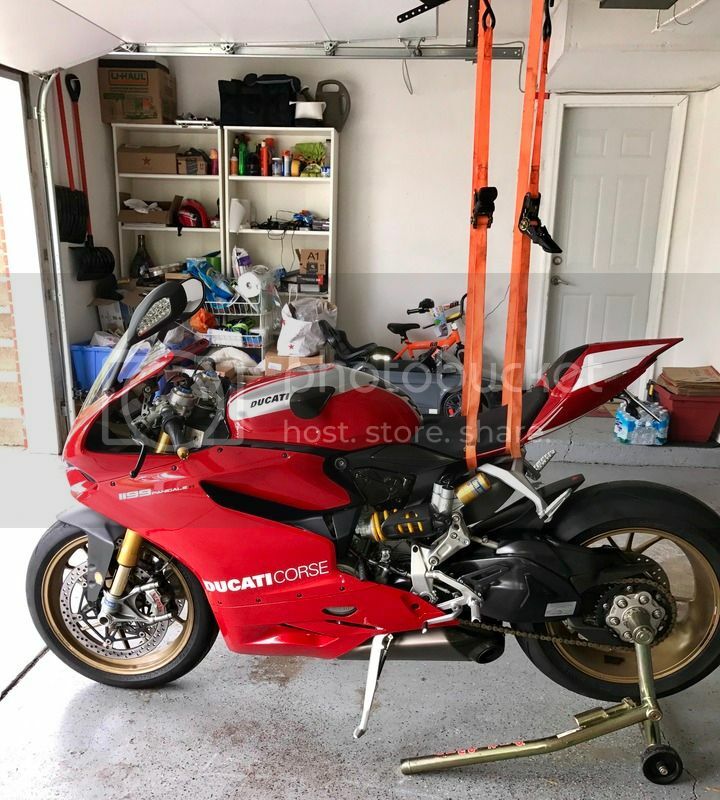 If you have some other sort of stand that will lift the bike while letting the rear tire hang go ahead and use that instead. I recommend that you remove your rear fender using the 4mm allen key(I could not get my allen socket to fit under the exhaust). There are 4 bolts, 2 on top and 1 on each side. I didn't remove the rear fender at first and ended up doing it later to give me more room to rotate the linkage. 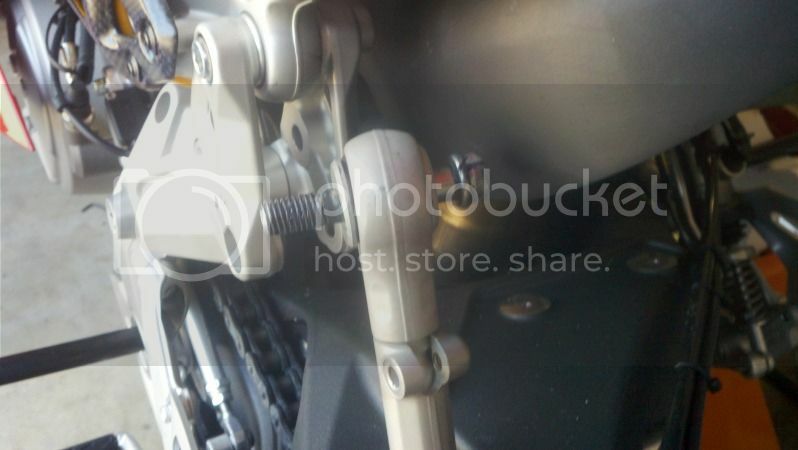 Remove Bolt A(swing arm push rod pivot bolt) using the 8mm socket and 13mm wrench for the nut on the back side. The rear tire will need to be supported as it will want to hang loose. And lift the push rod out of the linkage. 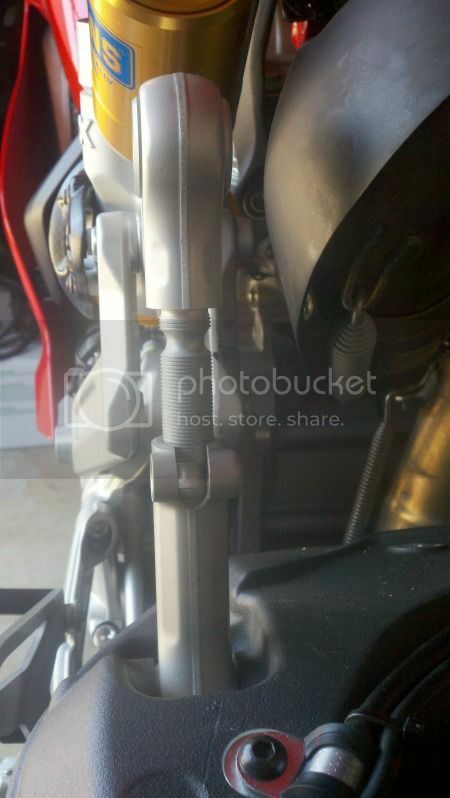 Now remove Bolt B(swing arm push rod retaining bolt) with an 8mm socket. I put the push rod bolt inside the push rod to twist it loose so I wouldn't make marks with pliers. 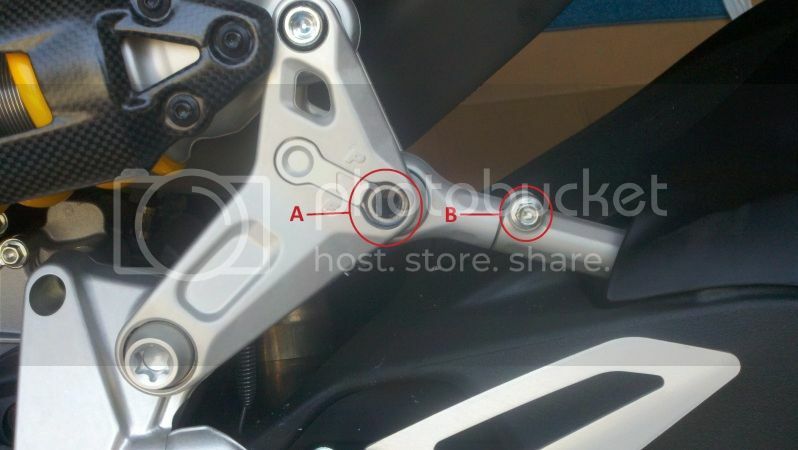 You will notice there is a slot where the push rod retaining bolt(B) was. You have to unthread (counter clockwise) the push rod a little over an inch to the second slot. This was very tight to unscrew. Now reinsert the retaining bolt and leave it loose. This will allow it to twist and line up later when putting it back together. Next is to pop out the little bracket(indicator block) that has the arrow pointing down to "F" and flip it 180* so the arrow now points up to "P". It will now block the original hole that the push rod bolt was in. You are now going to place the push rod ball joint into the linkage. It will now go into the hole on the linkage that is closer to the front. I had to lift he bike a little and move the rear tire up/down to get the ball joint and linkage holes to line up. It would definitely make it easier to have two people. Reinsert the push rod bolt(A) with grease and tighten up the nut on the back side. IMPORTANT: you now must tighten up the retaining bolt(B). When its done it should now look like this. Notice we are now using the front hole(was covered by the indicator block) and the push rod is threaded out further. Lower bike one side at a time from the jack stands and reinstall rear fender and lower fairings. I am trying to replace my suspension link with a gold ducabike one, I'm unable to unscrew that inner #4 bolt due to positioning. Not sure if that bolt and the link are one piece or two, it slides out, but not completely as it hits the exhaust. Any suggestion please? Unscrew top and linkage bolt first. Having two torx hold one and unscrew the other. Its two pieces if i remember correct. Try to wiggle and move the plate,it should go out pretty easy. Great topic guys, please correct me if I misunderstood some of the comments. The manual recommends “F” for track usage but are you all say “P” is actually is better? My Pani will be a track only bike so I’m trying to get the best advised from some of you guys that have put some miles on your bikes. Thanks! I tried my hand on this mod since my rear is on Flat and wanted to get the wife to ride with me. It was fairly simple, other than removing the face of the linkage like Zelnik. You have to spin the eye of the wishbone out so this is necessary. Since all of us transport our bikes one way or another, everyone should have these straps.